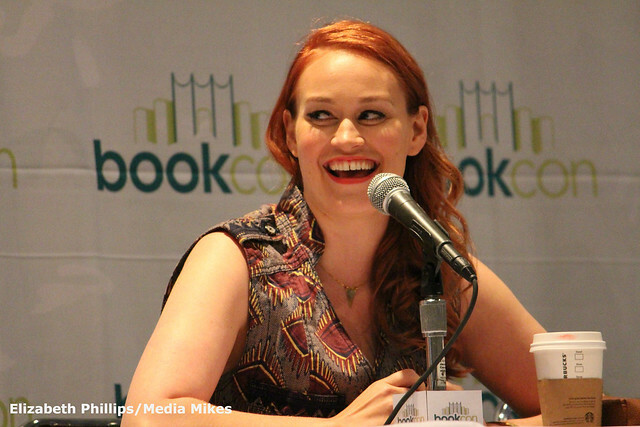 On May 30th and 31st, the Javits Center opened its doors to the 2015 BookCon. This event, described by its organizers as a place “where storytelling and pop culture collide,” saw both an increase in attendance and size this year. With author and celebrity Q&A’s, panels, autographing areas, meet and greets, interactive events and quizzes, and special screenings, BookCon had something for everyone this year. Many publishing tables offered free posters, postcards, tote bags, and books to attendees, while a booth downstairs offered many of the invited guests’ books for sale. While there were a few organizational issues, most of the attendees had nothing but praise for the event and cited huge organizational and regulatory improvements to last year’s BookCon, including the popular wristband policy that ReedPop affected with its most recent New York City Comic Con. While the event boasted a wide range of book genres represented, it definitely felt as if the young adult crowd was the most prevalent, especially with the many Youtubers in attendance this year. Next year, the event will be moving to Chicago and will take place on May 14th. Below are some snapshots from the event.